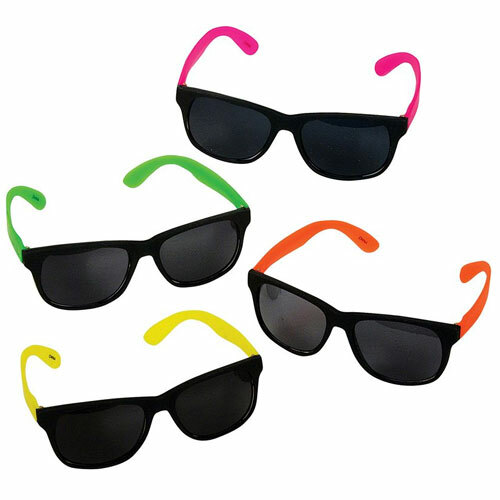 Have a cool look, trendy look or a flower power look with these assorted plastic neon sunglasses. Great for sporting events, your beach parties or for your upcoming vacation. This colorful accessory is a must for your sunshine themed events . This is a great product for sunny beach themes. We sell these glasses in a package of 12. In each package you have 3 pairs with colored branches. The branches are pink, yellow, orange and green. They are made of plastic and the frame of the glasses are 6 inches wide X 2 inches. The sunglasses are not recommended for children under the age of 5 years old.